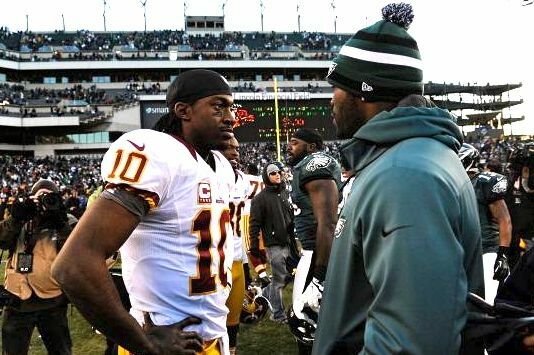 Robert Griffin III is about to write his own chapter in the Redskins-Cowboys rivalry. Photo by Bill Bride. Sunday night’s game between the Washington Redskins and Dallas Cowboys is the biggest game in years in the Redskins-Cowboys rivalry. The winner takes the NFC East. Dallas will go home with a loss, while the Skins can still make the playoffs if the Bears and Vikings both lose. The once great rivalry has become stale in recent years, but players like Diron Talbert, Dexter Manley, Roger Staubach and Harvey Martin stoked the flames in the ’70s and ’80s. Redskins coach George Allen started it all by making the Cowboys a bitter rival. To read my article on the best 20 games of the rivalry, click below. To see previous articles about the Redskins, go to www.myredskinsblog.com. Washington Redskins coach Mike Shanahan has his new quarterback, and it’s Donovan McNabb. McNabb, who has spent his entire 11-year career with the Philadelphia Eagles, has been traded to the Redskins in exchange for the Redskins’ second-round pick in 2010 (37th overall) and a third or fourth round selection in 2011. To see the full article on examiner.com, click here.